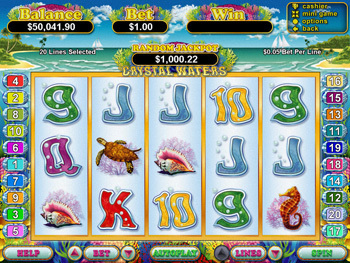 Crystal Waters is an RTG slot with a tropical island theme. The dolphins and the yachts are the main theme of the game, as a dolphin doubles the payout and 3 yachts appearing anywhere on the screen will award 15 Free Spins. There is many additional features built into the bonus feature. eg If you happen to get a bonus fish on reel 3, your payout will be multiplied by 2,4 or 8, and if there are 2 dolphins swimming near it, then your win will be multiplied up to 16x.